My adventures in astrophotography have been hampered by poor weather and (to be fair) a measure of lethargy on the part of your correspondent. 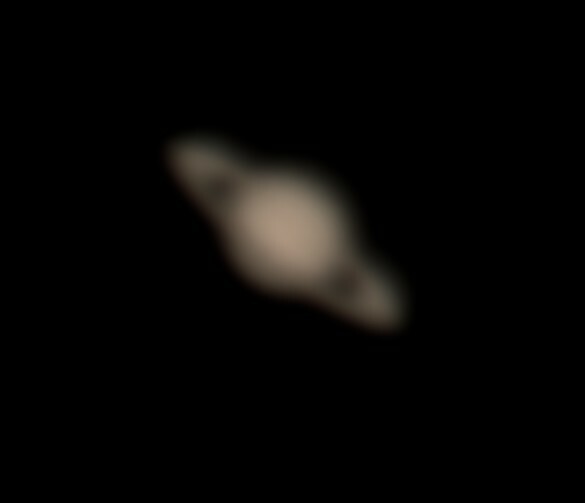 But tonight some clear skies heralded this first attempt at capturing Saturn, low in the south but still rather lovely through a telescope. I took this at about 11 pm local time. It's still cold here - indeed, we don't really get warm evenings in Wales any more. OK, it's not going to make the cover of Sky & Telescope, but it's another step and I'm pleased with it. I'm a little behind on emails and bookplates, by the way, but catching up slowly. Bear with me, as there's been a lot of travel these last couple of months, as well as two novels that need finishing. Cheers! Damn that's good, what is the spec of your telescope? Wow, considering Saturn's about 10AU, which is twice than Jupiter's, that's pretty (Expletive deleted) impressive! They don't make them now but they are quite well regarded as scopes go. Dave: I've a feeling I can do better, though, with some patience. Yup its all about practice, keep at it. I found that three nights of good skys let me fine tune my setup, the difference from day 1 to 3 was like Day to Night! Looks like you're getting an awful lot of seeing there. You said low on the horizon? You may want to get to a different latitude before trying again through all that turbulence. I keep meaning to build my own. I'm thinking an unnecessarily large 19" Dobsonian Reflector. Thoughts? PS I'm jealous, I've never seen Saturn, myself. Jeff: you're right in that if I could get up on the hill behind our house, I'm sure things would improve. But in the past I've found that having to load the scope and mount into the car is a real enthusiasm killer, quite aside from the awkwardness of getting the heavy tube in and out without damaging it or doing my back in. Then you drive to some godawful cold lay-by or parking spot where there's nowhere to get warm, make a coffee etc... been there, done that! On the other hand, I can get the scope and mount set up on my back patio and roughly polar aligned in a couple of minutes, and I can be looking at something a minute or so later, once I've taken the cover off and slipped in an eyepiece. I don't have to fold down the mount, either - I can get it out of the back door in one piece, fully assembled and with the legs spread out, needing only the tube to be bolted on. I can nip indoors to put the kettle on, use the toilet, consult star charts, internet etc. No contest! Re; HOS - as far as I'm concerned that and The Prefect are my two obvious post-9/11 books. The connections aren't accidental but it's nothing I'd want to over-emphasize, since there's a lot more in the mix as well. Plus, the author is dead. But we knew that. Okay, you win that round with 'kettle'. Nothing trumps that. Thank you for your thoughts, and seriously, you need to post more. Are you using a DSLR connector? Nothing trumps kettle in any argument. No, I'm not using a DSLR connector although I might get into that at some point. The camera is a colour CCD unit - I think there's a bit more info in one of my earlier posts. Hey Al, transit of Venus on June 6 and guess what? You're in the wrong place. China, Japan, Alaska, Nth. West Canada,and let's see, oh yeah, East Coast of Australia (my neighborhood) will have ringside viewing. If you're quick, I'll save you a spot near the BBQ and Plenty of coldies in the fridge. Just saying! I'm outside your house. No really, I'm right outside. Enter at your peril Muahahahahahhahahahaha. No, I mean I'm a lousy housekeeper. Nothing like a BBQ and a few Coldies while watching a little black speck trapse across the Sun.